Do you work for Rhinoceros? Rhino is used by students and professionals alike for a reason. It is really unparalleled in its usability, flexibility, interoperability and available support from the community. Precision is perhaps not as high as some other products, such as AutoCAD and Inventor, but for someone in the Architecture industry those tolerances are acceptable because of the scale we work at - we aren't concerning ourselves with micrometers of accuracy. If there is an issue, chances are others have had it as well. There is a robust community of Rhino users that can help with troubleshooting, as well as tons of forum content solving issues that you might encounter. There is also a lot of training material available. Rhino is generally able to handle most eccentric file types that we might receive from consultants. We also use it for the majority of our conceptual design and presenation-level modeling. Learning about Rhinoceros? We can help. "Versatile 3D Modeling tool, yet there is better software for drafting and documentation"
Rhinoceros is one of the most user friendly and powerful software for 3D modeling. The interface is made to make spinning and viewing models as easy and effortless as possible. For 3D models that are dwgs, I always opt to open in Rhinoceros rather than the native AutoCAD software. Furthermore, the ability to integrate parametric modeling and third party plug-ins such as Grasshopper also adds to the versatility and power of using Rhinoceros. There is a large community of users that seem to continuously expand on Rhinocero's features, and thus this makes the software more valuable. I believe the 2D documentation features to Rhinoceros are not as strong. There is an ability to do comprehensive 2D drafting, but honestly there is better software to handle this, especially if the drafting is meant to document several large scale drawings within the same project. Furthermore, typical graphical drafting features such as applying hatches or annotations are usually unreliable and buggy. 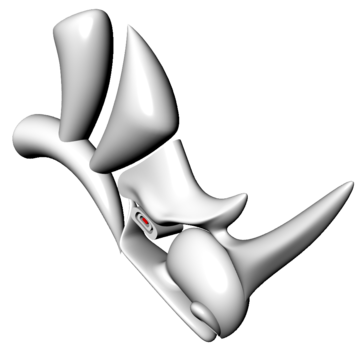 For NURBS and complex modeling, Rhinoceros is a complex and versatile tool. Many firms in the Architecture industry use Rhinoceros, and especially if one wants to become versed in computational modeling, Rhinocero's free downloadable plug-in grasshoppers is indispensable. The only drawbacks to Rhino is that for documentation of large drawing sets, other software is much better suited for this purpose. 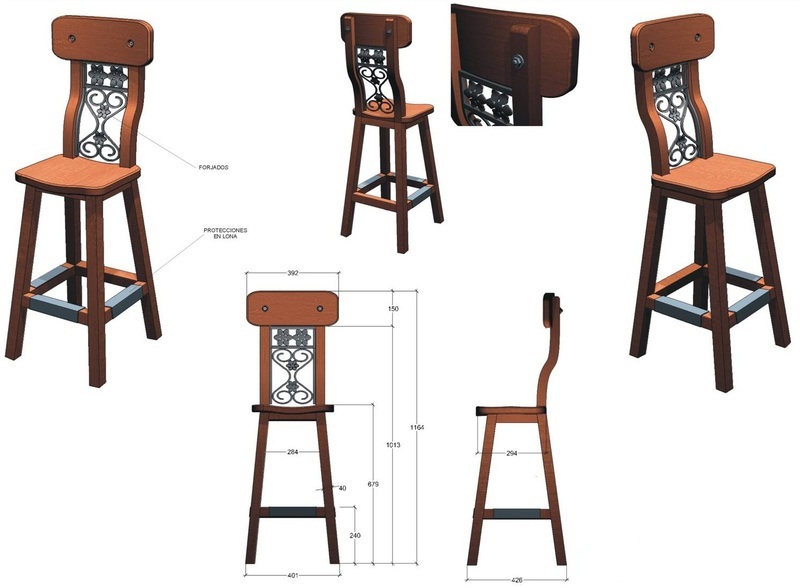 We are attempting to create 3D models that are geometrically complex, but do not require the level of large-scale complexity or rigor such as those 3D models that may be better modeled in software such as Autodesk Inventor or Catia. We essentially need to provide images of 3D architectural concepts that may later be modified in Photoshop. It's one of the best software for creating a 3 dimensional design and objects with depth to understand better.The functions are pretty simple and very user friendly .If you need to make command such as "SPLIT" ,you just enter SPLIT in the command bar and the software will perform the command for you. There is nothing i dislike about the software.But i must say that it might seem a bit tough in the beginning but as soon as you get the hang of it ,you will start liking the software.When I 1st started using this software i had lot of assumptions about the software,and i thought it was really confusing but apparently it is not. Definitely on the top list to consider and buy this software if you really love and creating objects . Industrial design companies use this software from many years and the most user friendly one . Recommended for new design students to improve their skills and get a hang of the software. Its a good skill posses and helps in building your portfolio. Business such as high end Architecture Company requires to analyse their models in 3 Dimensional Area, also for Product Design companies require and has benefited by using this software.It is better to consult the client and show them the products as they can imagine in 3D. "A program for parametric modeling"
At first, it is complicated to use the program with the options that the mouse has to move through the workspace, since the other modeling programs differ from this one, which forces us to adapt again for the use of the rhinoceros. The program is a little more complex for the knowledge of the commands, that is, for the use of each step that must be carried out to achieve the desired action. Flexible and extensive control over geometry: curves, surface, solids and meshes; transformation, model manipulations (rounding, solid operations, sweeping & lofting, trimming…). The focus is clearly NURBS geometry and to a lesser extent Mesh geometry. Subdivision modelling (as a hybrid between NURBS and meshes, from the user's point of view) is upcoming. Attractive licensing, without subscription or forced yearly updates. They also have an open policy for educational users: low license, without usage or feature restrictions (even commercial work). Quite exceptional. Rhino has file import and export convertors for a wide variety of CAD and design formats. Via plug-ins you can even expand this more. Impressive versatility, esp. when adding the Grasshopper visual programming system (add-on). For architectural and BIM design, extensions and plug-ins are available to extend and improve the usability. That said, don't compare it directly with software like ARCHICAD or Revit, as they have a different purpose. It took a few years to arise, but the Mac version is now becoming very usable and quite complete. Not for 100% as some plugins and features remain Windows-only. No free student version (but license allows commercial usage even for EDU users). Mac version does not support Grasshopper, so still need Windows version. Could be better integrated in e.g. BIM processes (partly solved by add-ons). When complex 3D geometric editing goes beyond what AutoCAD or SketchUp provide or when you want to use Grasshopper, this is the CAD system to use. Complex geometric model creation, especially if smoothness and continuity are required. Personally write a review for rhino is too difficult because this specific program is not something we can describe it in a few words! It is the best program modeling in 3d print process and working with surfaces and polysurfaces. It is easy to add plug-ins and expand the program. Fluid views and easy to access. Another big advantage is in last version grasshopper is inside the program. For scripting we can add python and use rhino script syntax. In rhino 6 the rendering and light are developed. Huge amount of import and export files. Super easy to customize interface. Easy to access to commands. is not just about working with surfaces and nurbes, for working with meshes also rhino is one of the bests. Personally in last ten years I couldn’t find some disadvantages on this program. I was facing with some errors and the support team solve it as soon as possible. if they can add some other plugins like python for make it more flexibale to scripting it will be perfect. its perfect but if they can add python and rhino script syntax inside the program it will be the best. I started working with rhino during my bachelor degree and after I continued in my work-place.after expanding my job I couldn’t find something better than rhino and I just continue with rhino and im using rhino every day as my primary program for product design, car design, interior design etc. Setting up for multi-user environments can be tricky. Right now, since I have to capture and reimage every semester, I have to load the default user HKCU and literally delete a registry key so that it gets created fresh for each user, otherwise it tries to use the toolbars in the Administrator profile. It also doesn't have the BEST rendering engine, so I suggest you get V-Ray for Rhino to go with your installs of Rhino. We have faculty who teach how to model in Rhino, which makes the students use it and Sketchup almost exclusively for doing models and renderings. We have used it on the IT side to make some custom items that we then 3D print to replace broken parts, which does save us hundreds, if not a couple of thousand, of dollars a year. Rhino's License manager, the Zoo, is very nice, lightweight, and does give some great statistics, and makes reviewing your license usage over time easy. It is far better than many other LS than I have used. Sometimes the integration in to Autocadd can be tricky but with a little testing the controls can be set for better output. "Rhinoceros, challenging but very interesting"
Rhinoceros has a huge amount of tools to create unique shapes. It has a nice interface so that if you are familiar with other softwares like Autocad or 3ds MAX, you won't have issues in using it. It can be improved with nice add-ons, like Grasshopper or Visualarq. It is really eay to be learned and it can be used in many fields like automotive design, architecture, industrial design, 3d printing. It has no fancy functions and it is extremelty fast. "Easy to use infinite possibilities"
What is amazing about Rhino is that it is very easy to pick up. And with a few tricks, anything you can imagine can be modeled. It can be intimidating at first but after a while things get much easier. What is important to know is that there is no single way to execute any given task. The McNeel web information on each command is also great and pretty informative. They have little videos of every command. I have not seen such detailed explanations elsewhere. "Very complete 3D CAD software"
I love Rhinoceros for many different reasons, one of them is that this software gives the user the freedom to create and design using its precise tools and four different view angles at the same time. Together with that, Rhinoceros allows the user to customize its layout, making it easier to adjust the software to your needs. It takes time to learn all of its features and to be able to use it to its full capacity, in other words, its learning curve is really steep. Also, Rhinoceros pricing is not very friendly, it is quite expensive. Try experimenting Rhinocero's features and get familiar with its design before modelling and designing projects with it because it can be quite difficult to use it in the beggining. With Rhinoceros, I was able to design 3D objects and send them to a 3D printer. These objects were used in events to decorate the environment. "Well design program for rendering"
It´s the better software when you want to design in a freelly way, this is an excellent option to rendering plugins.the edition of materials it´s as well the best in the market , you don´t need to do so much , and reading the manual you can learn super easy. the freely tools of modeling its as well super easy to understand, and if you want to do surfaces and solids you can do it fast an easy, the only problem that i had its the import tool , its not easy as a I wantet to be, there will be a better solution for tis and maybe in the future this could be solved. Maybe the interface would be more easy , and a better form to learn without the necesity of courses .And the useas of cameras , it not easy to manage , and maybe the opton to renderin in isometric, only one object , not all the scene. The importation tool it´s not perfect, in some cases you can´t importe the models completely , and in some cases some parts of the model you can´t see. Its an easy tool that solve tha necesities of rendering and modeling, and its a way to do the things betterand in a easy way. easy and quick modeling and rendering, and at some point its more easy to explain a new worler the program than others. "Rhinoceros is the best and most complete 3D modelling software out there"
One of the best features that the program has is that it allows the user to write commands in a toolbar. This speeds up the whole modelling process. Also, the fact that the program shows the user four different views at the same time is game changer, it helps a ton. Finally, it's straightforward and clear design creates a good atmosphere to let the user's creativity flow into the modelling and designing process. My main issue with Rhinoceros is that it can be a bit inaccurate and imprecise. Especially when using the technical drafting feature. Also some tools can fail from time to time and not work properly, and i these cases the user needs to save the project and reopen the program, which can be quite annoying. Rhinoceros has really assisted me in designing new and innovative projects with it's great features and tools. With this software, I was able to grow as a professional in my line of work. "Rhino, for complex 3D modeling plug-ins and workflow "
I must use nurbs for specific projects, so Rhino is my go-to. It is better for project printers such as CNC milling, etc. It works well with all of the new renderers that I use, such as Vray. It has a good user interface and workflow that is straightforward. The normal issues such as it is very expensive to update, it does need other plug-ins for certain applications. It is time-intensive and not a "fast" software for time sensitive projects. Rhino is great for modeling, for use on big heavy-duty architecture and industrial design projects. Rhino meets my 3D needs as I do a lot of rapid prototyping, project printing, interior design, jewelry design, etc that requires plugins and complex modeling. Rhino was one of the first 3d programs to come out so many users such as myself are familiar with its interface already. I love Rhinocerous.. have been using it since version 3..... it's my go to software for architectural 3D models. I love that even though its not an autodesk product its pretty tightly integrated with ACAD... in terms of both import/export ability as well as the similarity in the tools / inputs. Commands are usually very intuitive... if i want to copy something i type copy .. wow! As with all programs without the right hardware it will crash (luckily autosave is pretty up to par), sometimes i wish it could better handle my mistakes though. The learning curve for more complex tasks is steep.. although there is quite a community out there to help you with it. We prefer renderings be done in-house as opposed to outsourcing - it may not necessarily be more cost effective but the ability to update models in real time is critical to design integrity. "Best surface modeler for the price, and a very active user community "
The tools for the price is a really great value for educators and students. I also like how easy it is to extend Rhino and there is a very angaged user group that develops plugins for Rhino and Grasshopper. Last, the development process for Rhino is very transparent—no new releases until much testing by users (for free), and the company is very responsive to its customers. There are a few tools in Rhino that feel messy or buggy. For example, Make 2D Boolean commands sometimes create more problems than they solve. But otherwise, great product. Accuracy with 3D modeling along with interoperability with CNC tools. "Arguably the Most Versatile Surface Modeling Software"
It provides a wide range of tools and commands for me to build lines, surfaces and solids. There are tons of different methods to create the same geometry in Rhino, each method comes with its own advantages. You can easily and very quickly build surfaces and they will be suitable for industrial production. Besides using it for product design and architectural design, I also use it for graphic design. It has great capabilities for creating, transforming, distorting and arraying 2D shapes for vector graphics, which are sometimes non-existent in software like Corel Draw or Adobe Illustrator. It can import export many filetypes suitable for graphic design. Its help file is more than enough to teach you from scratch. It works very similar to Autocad, so if you learned Autocad somewhere, everthing gets even easier to get started. Plus there are lots of tutorials all around the web. Rhinoceros has a very expansive resource hub, where you can find a wide range of learning materials, plug-ins and events. I especially love it for the variety and large amount of plug-ins. Rhino is also very light in terms of disk space and processing power it requires, when you compare it to other NURBS software. Although you can create very high quality surfaces and objects, it needs to get better at Class-A surfacing. If you are looking for a control level similar to Alias Surface or ICEM Surf, you need to get a plug-in for it, which diminishes its cost advantage. Even then, you will not be able to achieve a detailed technical control like ICEM or Alias. You cannot control number of spans and control points while building a surface or a fillet surface. You cannot produce chordal fillets (Well, you can work around it; but it requires too many steps and takes a lot time compared to its bigger rivals). When you want to play with Control Points of a surface, can use many translate commands but you cannot bulge them along surface normals or slide them (Well, again, you can work around it; but it requires a lot of work and time). But these are apparent only if you aim a fast Class-A work. If you are looking for a surface modeling software that is easy to learn, easy to use and capable of producing quality surfaces for product design: just get Rhinoceros. It is always developing, and open to development with the help of large amount of plug-ins. Its export-import support is phenomenal and it is compatible with many render engines too. You will never regret having it. - Surface Analysis and Draft Analysis of geometry built by other designers. - Designing 2D or 3D graphics for print, web or using on products. "Rhino vs Sketchup - general CAD"
making and editing arcs. making and editing complex lofts / curves. BoxEdit quickly shows all dimensions of an object. it never seems laggy to me. there are a fair amount of snap options and it's relatively easy to access a lot of the tools via small buttons on the screen AND drop down menus. you can put items on layers and then select all the objects on a layer / change their color / hide or show them. hotkey options are either entirely missing or very bad. i haven't found a way to make a nice professional looking layout. taking dimensions of distances between points is not as easy as it should be. Rhinoceros is a good software to model items in. Especially good for complex shapes / arcs / curves. If you are making cabinets or designing kitchens, google sketchup might be better for a few reasons; sketchup's Layout option is easier, taking dimensions is faster; editing parts of simple cubes / boxes is easier. i use rhino to 3D model complex parts for CNC machining (chair backs, shoe shapes, table legs, etc). "Learned it in an educational background, kept using since and still using as of today"
Feels very professional and complete, you can basically create anything if you reverse engineer that thing and figure out how to make the best of the tools that Rhino makes available for us. It takes a little while to get used to and to be able to make the most out of the software. I had 2 years of classes specifically for this software and V-ray and I still didn't feel like I knew the software all that well. It allows me to create 3D models with a lot of precision for 3D printing and/or to create 3D animations and visuals. For example small accessories that I can model in Rhino, 3D print at home and sell online or at trade shows really quickly and efficiently. I like that I can be very precise with dimensions when I input exact numbers, but I can also do things manually and by eye in the three views. I also love the cleanliness and integration of textures. I also really like the 2D with different views option. Sometimes it crashes on me. I also wish that more textures were included and for them to run faster when it renders. Rhinoceros is great, I took two classes that taught me how to use it, and it was easy to use from there. I tried to mess around with it before the classes and it was a bit hard to use for me, but if you plan on making 3D models with precision for any purpose I would highly recommend this program, especially if you have a mac. I made models for a 3D video, I've made diecut cut outs, I've also made models for a product. I'm quite a fan of Rhinoceros, I've been using this software for almost six years now and I think I'm not even using the half of the things that can be done with this program. I really like that it's a very light and stable software compare to other 3D-modeling programs. The best thing I like is it's mac compatibility, it's a major game changer for the sector. There are a couple of things that I think could be done better. The first one is creating blueprints, currently putting together technical drawings directly from Rhinos is not easy, it can be done but its quite tricky. The other thing I dislike is the inability of creating constraints to set interactions between multiple pieces. I would say that is a good intersection between organic/surface modeling and technical modeling. Great for Industrial Designers and makers. General CAD in a mac environment. Great and precise 3D modeling in a software that is not as restricted as others like SolidWorks and Inventor not as basic as SketchUp and not so non-technical as Maya or 3Ds. "Rhino For Every Type of Design"
I love the ease-of-use and flexibility of Rhino. It is the top program for all of my design needs and the easiest way for a designer to make their ideas into representational objects. I have used this for building design, graphic design, technical drawings and many other design services. I feel as though Rhino has so many commands and so much power that goes unrealized because the interface is a bit complicated. There are commands that solve my needs; however, I won't find out about them or know how to properly use them until years later. I would recommend training before using Rhino. It can be intuitive at times, but other times very complicated to perform other tasks. I also would recommend looking at all of the other plug-ins for Rhino such as Grasshopper, Python, and countless others online that allow you to do simulations and other tasks less related to design and more related to technical fields. "For us it is a fantastic tool in our yacht design business." The sheer ease of use. Together with several render engines it is a true gem. Never did a course to learn it. It is pretty straight forward from the start. We can flatten the 3D to 2D to continue our elevation drawings in another program. Ipad app for showing models on to go. Sometimes i loose all my toolboxes so in need to reinstall those again separately. It would be good to be able to export it into a 3D PDF or similar for client review. 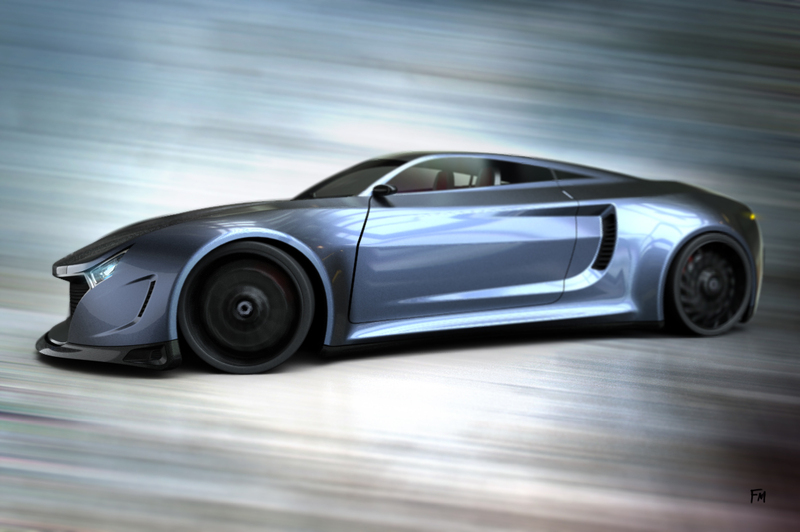 To create beautiful images you should think about purchasing the Maxwell or V-Ray render plug-ins as well. It is easy modeling the yachts and interiors we design. We also design cnc files for moulding large GRP structures with Rhinoceros. "Perfect for modeling and fabrication"
I use Rhinoceros mainly to prepare files for digital fabrication and to create 3D models for 3D printing. It's easy to use and has a lot of handy plugins that make the preparation processes easier. I also teach classes at an architecture school and I found out that Rhino is one of the easiest softwares to explain as it has an intuitive interface and clear commands, also there are several ways to call each command such as typing the command name, searching for the icon in a tab or selecting the command from the drop-down menu. You can also customize toolbars according to your activities. Another bonus is that you can make pretty good renders on Rhino, the internal Rhino renderer is good for drafts but you can install VRay to have more setting and create really good images. A Rhino for Mac license (for educators in my case) is just 99 euros which is much cheaper that other similar programs. Some functions require a lot of repetitions of the same actions. But that can be solved by writing a script or using a plugin. Choose Rhinoceros if you fabricate things or make models for 3D printing. I would also recommend getting Grasshopper which is a free plugin with lots of tools for automatization and parametric design. I use Rhino for my 3D printing business so I benefit greatly by saving time and effort when I use Rhino. Absolutely all of it. It´s the first modelling software I started using. I really like how easy it is to move/rotate/zoom etc.. and how easy it is to model. Although it´s quite technical it´s very easy to use. I also like that allows to import and export many file formats. It´s from a very big company, with very useful support + you get thousands of videos on youtube. You need some advance IT skills in order to instal and uninstall plug ins. You can easily screw it up if you start playing with the settings, especially toolbars. Take a look at their website, there are always new plug-ins and videotutorials , they are very very useful. The company offers training but there are multiple companies offering support which are also very interesting. Youtube is also of great help. I use it as my main software in order to model jewellery however I need to use Matrix ( which is a separate software/plug-in based on rhino) in order to lay stones, settings, etc.. it is possible to do it using just Rhino but it would take me ages. "Rhino to create product in 3D"
Rhino is one of these software that you can learn by yourself in less than a week. The interface is very intuitive, and the possibility are huge. As a mac user i'm a bit disapointed about some interesting features not available on mac but available on windows. Even if you have lots of tools, shape exploring is not as good as in software such as alias. however some plugin allow you to fill this lack. Rhino is a good choice if you want a powerfull and easy tool to use. The community on internet is quite good, and there are lot of tutorials available. lots of plugin are available for different fields such as product design, architecture and engineering. "Best mixture with Shapes and CAD"
The interface is very easy to understand and start working. Also you have a huge quantity of tools to do anything, and this fact allow you to achieve the same in some ways. That feature provide Rhinoceros to be the best program in 3D I used. 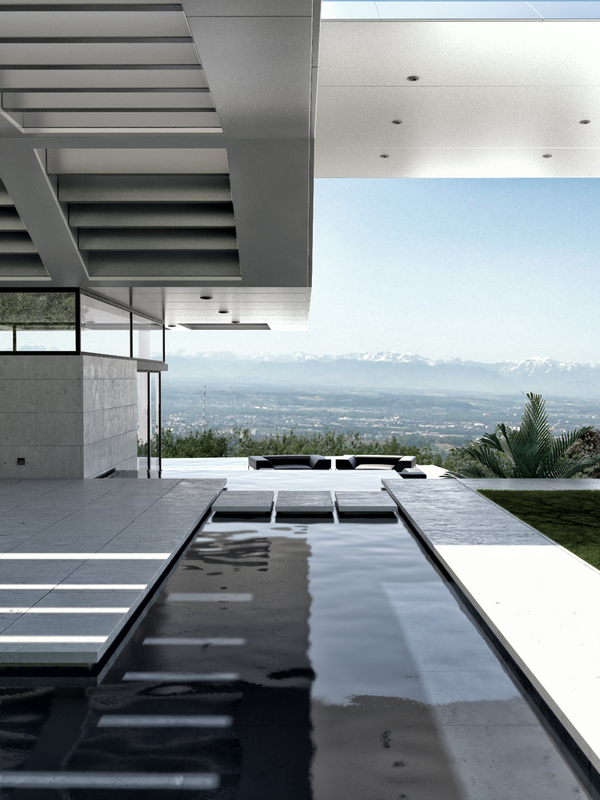 It have a lot of plugins, as Maxwell or Vray, to render your designs as a real photography. Or architecture plugins as Grasshopper, gives you wins to be the best. One of the most valuable things of Rhino is that you can design in CAD parametric, curves and planes (no solid) even in meshes!! Awesome! The interaction to pass a mesh to solid is not very good, is good but not perfect. Also I miss some floating tools to interact as in Inventor. Some tools sometimes fail and it will give you some headache, but you can always find other way to do. Rhino allows you to have a tool to be the master of 3D CAD/Difficult shapes with a very (if not the best) prize range. This software is easy to use, friendly with files -because can open a lot of them in the world- and have very good features that in other way you need 2 or 3 programs at time. Difficult shapes that an typicall CAD program (as Inventor, Catia, Solidworks) can not achieve. Express design is a fact, so you can optimize your time and your customer will be more happy. Less time working is more time thinking, so you can achieve best designs. As an engineer turned design student, I found the manipulability of the surfaces in Rhino, in comparison to a 3D modeling software like Solidworks, exciting and fun. You can push, pull, and cut up surfaces much in the way you would be able to if you had the solid object in front of you. In this way, it is software much more conducive to creative projects. Coming from Solidworks, the few things that disliked about the software were difficulties in/lack of ability to parametrically drive dimensions and going backward and changing things. In order to make things to a certain dimension, you have to put the values in from the start (there is no way to draw something and then define the dimension from what I could tell). Also In Solidworks, you can go to the original reference sketch, change it, and then the model updates. I could not figure out a way to do this in Rhino. This made making changes rather bothersome. Definitely use it for more creative design. If you're looking for a good front end, look no further. If you're looking for more back end, look at AutoCAD or Solidworks. I was designing a tea/coffee cup and saucer combination for a class. Rhino allowed me to take my sketches, create 3D models from them, and then fine tune and tweak the surfaces for 3D printed prototypes. Again, the manipulability of the surface (being able to pull and stretch things) was helpful as I determined the final form of the cup and saucer. The logic we use to do modelling in Rhino is very interesting. It is some kind of doing sculpture where you cut and join different piece of work together. It is quite similar with autocad in the sense of manipulating 3d model on 2d sense of thinking. Sometimes Rhinoceros crashes without backup file and causes a lot of trouble for people who don't have the habit of saving every short period of time. 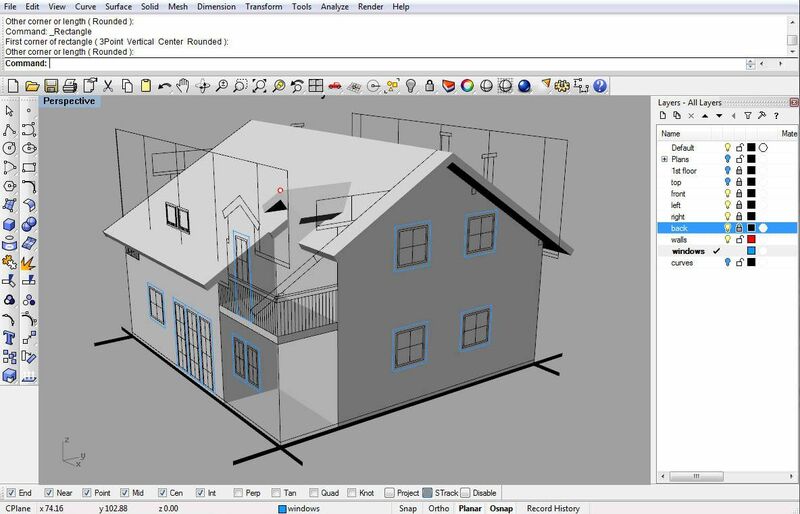 "Great tool for designers and architects"
Rhino is a great tool for designers adn architects. In combination with Grasshopper you can build very complex parametric 3d models. Users interface is very similar to the AutoCAD and the command line is very useful and allows quick access to all commands. Rhino also great value for money as it way cheaper than most of other 3d modelling software. Versions are updated only when there is a good reason to update it, not like some other programs which are updated every year with very little changes. Rhino has very powerful 2d drawing tools and it can be used as CAD software for smaller architectural projects as substitute to AutoCAD. Mesh modelling tools are very basic. Texture mapping and animation tools are quite limited. Fbx export could improved by adding more options. V-ray plugin does not have as many features as it has in 3ds max. I would definitely recommend Rhino as primary modelling tool for designers and creative architects. Creating and managing parametric 3d models of the complex buildings. In combination with Grasshopper you can do as many iterations as you want without spending too much time on it. Rhino is a versatile 3D modeling tool that can be used for the simple generation of basic geometric forms to more complex modeling. Rhino uses NURBS (points) as opposed to most other design software that is strictly vector (line) based. This allows users to achieve more complex geometry. Rhino's interface has a familiar feel if you are accustom to other CAD software, with tutorials built into the software. It has a very robust tool set, and as an open-source platform, there are plenty of add-ons and plug-ins available, making it one of the most flexible and versatile software on the market. The workflow when trying to move a model and its information between software can be challenging at times. It seems to be improving though. Solving complex building design that cannot be achieved with other, more rigid, building design software. I also use it for rendering and graphic design. "I use Rhino as a modeling software in school." Rhino is by far the easiest and most versatile 3D modeling software I have learned. I use it for almost all of my projects in school and I use it at work to build models to show clients. There's nothing I dislike about Rhino. It's a great tool that I use daily. I use rhino instead of sketchup at work because it's a more customizable modeling software. "A great software for sketching 3D"
Th interface on Macintosh is great, really intuitive and easy to handle. Even if there is a lot of different settings, I never feel lost. For example you can just type the command directly on the keyboard and it will launch the command instantly. The trackpad integration in this software is great, I do not even use a mouse to use Rhino. You can copy and past, and quick start modeling your shapes. Rhino is great but it had a lot of limitations. Doing geometrical shapes is easy but when you start trying to do organic shapes it is more difficult. Also if you want to change something on the model for example if you want to change the fillet or modify the size of the shape, you have to do everything manually. There is no links integration. "The easiest 3D software around"
This software is extremely easy to understand thanks to an intuitive interface. I have tried some other 3D softwares before (Solidworks, 3DS Max...) but none of those really worked out for me because they seemed and were really complicated to manage. Maybe the work we do on Rhinoceros is a bit less precise than with Solidworks for example (in terms of measurements etc...). Mybe it can be good also to take example on Solidworks for the "edit plan" option ; so you can directly create Plans of your 3D shape with measurements & all. Don't hesitate to give it a try, as it is really the easiest and most accessible 3D software around to me ! It is way faster for me to CAD anything ! It's a real gain of time. There is so much to learn and it can be difficult to know what all the software is capable of. Student work, it is great for modeling and running scripts that generate forms and patterns. "Very happy and excited about having a well rounded and open cross platform modeling program"
There is a really nice balance between user interface elements and command line interaction support. The program has a clean and elegant feel and encourages creating models of similar nature. Overall Rhino supports a massive amount of features within a well designed program that both allows entry level users to get started without feeling overwhelmed and power users to make the most of the program and not feel features are lacking. Less support for plugins and extensions on the Mac client however this is being worked on so I'm not that unhappy. Allow the program to be both very simple and very powerful depending on your current need. Integrating advanced modeling topics into academic research project and teaching advanced modeling in architectural and visual arts design curriculums. "Great Product for The Time Being"
The UI and learning curve are easy for Rhino. It's fast to make pretty good looking 3D models. It doesn't really integrate with other software easily. While there are export options to other formats like AI and 3DS, other applications play better. Autodesk does a better technical drawing, but much more difficult to work with. Rhino is great to start out. McNeel is a little slow with rolling out newer implementations. The pricing is alright, especially for academics. Few crashes and fast on a mac or windows. It's very responsive. I preferred the older design; the new icons are corny but it still has the type input for faster advanced users and tons of plugins to make textures and lighting. Fast 3D modeling and spatial understanding have been solved by rhino. It renders out nicely. "My favorite 3D modeling software"
There are so many things that I ike about Rhino. It is really good for modeling products, spaces and concepts. I think it is very easy and intuitive, you can learn it really fast. The way you use the tools and commands are very easy because when you use an specific command, it tells you what you need to do. So far it has been a little bit difficult for me to modeling characters. Sometimes I have tried but always I have desisted. I recommend to learn Grasshopper. Grasshopper is a complement for Rhino, in which you do parametric design. It has helped me, modeling different products and spaces that I have created through the years. "Rhinoceros Product Review (experienced user)"
The best thing is that Rhino tools allow users the freedom to create any shape. if you can imagine it, it can be done. The way of modelling (NURBS) allows full creativity when designing complex shapes. It is incredibly quick to create shapes and surfaces, which makes it the perfect tool to use when exploring concepts in the early stage. Rhino is incredibly inaccurate for modelling complex products and cannot be used for final tooling models. This inaccuracy makes it very difficult to join all surfaces to make a solid shape. For this purpose, I recommend using CREO or Solidworks. Secondly, making changes to a final model means deconstructing and building surfaces up again. This can be extremely hard to do, making changes a nightmare. I use Rhino to explode/ section and explore internal details of very intricate products before converting into a rendering software such as Keyshot. The flexibility of Rhino to allow users to cut and explode parts makes it very useful for exploded diagrams, sectioned views and other illustrations which can not be obtained easily through photography (real products).